Maybe the challenging pronunciation – cure-a-sow – is a turn-off. Perhaps its lack of as many magnificent beaches as other islands convinces sun-seekers to head elsewhere. But the relatively few Americans who go there are richly rewarded. Begin with the island’s intriguing history and cultural tapestry. Add some of the best diving and snorkeling anywhere. Throw in an architectural gem of a mini-city that combines tropical touches with European flair, along with an enticing choice of outdoor activities and extremely friendly people. In my opinion, the beaches get a bum rap. After all, how many do you need during a short stay? The three dozen-plus on Curacao include both expansive stretches and tiny swatches nestled in little coves.My favorites are Grote (Big) Knip and Kleine (Little) Knip. Both offer soft white sand and shade provided by large trees, and are lapped by stunning turquoise waters. Grote and Klein Knip are not the only places with Dutch names, as the island’s history and culture are closely entwined with what today is the Netherlands. The earliest known inhabitants were Arawak Indians who arrived some 6,000 years ago. They were followed by Spanish explorers who came in 1499 seeking gold and other treasure. Finding none, they included Curacao on a list of islas inutiles (“useless islands”). The Dutch were after something else. 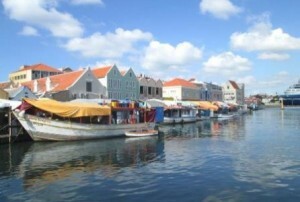 Attracted by Curacao’s deep-water port, they seized the island in the early 17th century. That launched Curacao’s long tradition as a trading center. Trade attracted immigrants from around the world, creating the ethnic melting pot that today includes people from over 50 nationalities. Wealthy Dutch traders built stately plantation homes, some of which have been restored and house restaurants, art galleries and museums. The island’s history also may be explored in other ways. The obvious starting point is Willemstad, the storybook capital. Read the full article, originally published on January 30, 2017, on Fifty Plus Advocates.